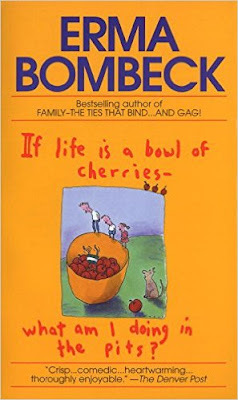 2017 Challenge - Book #22 - Life Is A Bowl Of Cherries - What am I doing in the pits? I finished 22 books in the month of Feb., and in another day I will have another done. Moving right along. Today I am reviewing: Life Is A Bowl of Cherries - What am I doing in the pits? This book was written quite awhile ago. I was reading it while I was visiting my mother, and she remembers reading it when she was younger. That made a lot of sense because I didn't really find this book all that funny. I chuckled a time or two, but for the most part, I did little more than smile at what she was writing. I know it was mostly because I really couldn't relate to it. IT was written in the 60's, so what did I expect. 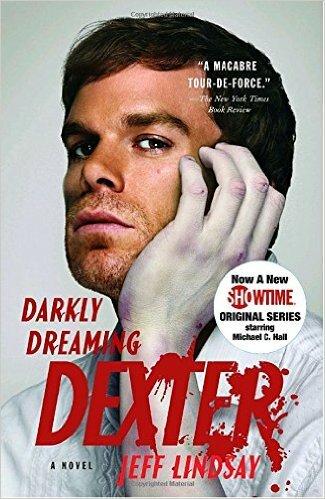 This is the story of a man named Dexter which Amazon calls "A polite wolf in Sheep's Clothing". He is a serial killer but he has a rule - he can only kill bad people. He has had sometime "off" about him since he was a child and taken in by an adoptive family. Now he works as a blood splatter expert for the police. This position helps him identify his victims. Now he is involved in a murder case that seems to be trying to be a copy cat of his own crimes. As one murder proceeds another, Dexter becomes more and more involved in trying to figure out who is committing them. He has mixed feelings - he wants to stop the killer because this person is killing innocent people. But he is also transfixed with the details and way this killer presents his victims. This was a pretty good story. I had watched a few episodes of this show when it first started, and found it mildly entertaining. So I knew what I was getting into when I picked this book. The book - as usual - explained a lot more in detail the character and why he is the way he is. Dexter is emotionless - he cannot feel love or empathy for others. He never has. But he has had great practice of "playing human" and to the public he comes off as a kind, caring, well meaning person. I recommend this book. Now that you know that the story is about, you can make your own decisions about reading this type of topic. But it was told well. 20 books down in two months - YES! Thank you crazy winter break kids had. The first line is "Lydia is dead. But they don't know it yet"
Right off the bat, you are drawn into the world of this family. This is the story of a Chinese American family living in the 1970s in a small town in Ohio. Their children are Nathan - the eldest who is a bright, well liked student who has been admitted to Harvard and cannot wait to escape to college. Lydia - the middle child and the favorite among her parents. Her mother sees Lydia being the doctor she could never be, and her husband sees her being the popular girl he never was. Then there is Hannah, who is the 10 year old "surprise" who is all but ignored by her family. The story jumps all over time starting with when the parents in this story were young and growing up in very different environments. The wife was a student in college when she met her future husband who was a graduate student. They fell in love, she got pregnant, they got married, and she never finished college. She always regretted it - even leaving the marriage at one point to try and finish college and go on to medical school. But things happen and she returns to her family and her life as a stay at home mom. When Lydia dies, the family completely falls apart. They don't know if she was murdered or if she committee suicide, and they try to piece together what happened to the daughter that was the center of their world. This was a great story. I likes how it went back and forth through the past starting with when the parents were young through their early marriage and when the children came along. Every character had their chance to tell their view point - even Lydia. The author works through the past to the present to show how the family got to this point and how they are going to move forward. 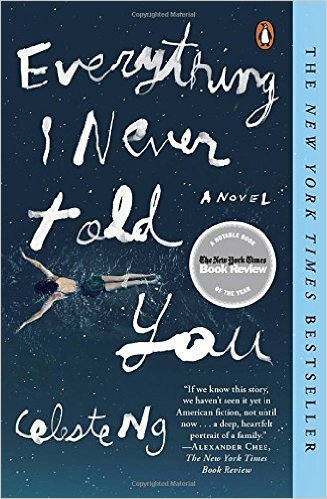 The only thing I didn't like is that the wife did up and leave her FAMILY - no note, no explanation, when Lydia and Nathan were small - to go after her dream of being a doctor. She felt that she couldn't be a parent and a wife and a student all at once. It didn't make much sense - didn't really fit the character to be that selfish. Even though she was going gone 9 weeks before she returned home, it seemed to be leading that she was never going to return to her family. Check it out. I think it is worth a read. This is the story of Ruth. Ruth is a 20 year veteran nurse who works at a small hospital on the labor and delivery ward. She loves her job and her patients. One day, she is taking care of a patient who is a white supremacist, and Ruth - is a black woman. The patient and her husband ask the nursing supervisor to remove Ruth from their baby's care. A note is put in the baby's chart that says "no African American care takers for this patient". Ruth is the only black nurse on this floor, so it is clear who they mean. During one of her shifts, the baby goes into distress after a routine circumcision while Ruth is the only nurse available in the nursery. She is torn on what she should do because she was told not to touch the baby. She does do CPR on the infant at the direction of her supervisor, but this results in Ruth being charged with a crime. In court, her lawyer tells Ruth that they cannot play the race card because they want to show that Ruth was just doing her job - that this wasn't about the color of her skin. This was a pretty good book. I enjoy Jodi's books, and she usually pulls a huge twist in the end that I hate, but this time she didn't. What I DIDN'T like about this book is the stereotypical black and white issues. She almost made them too extreme. I am sure that extreme exists - in fact I know it does - but I think Picoult took it a little too far. I found myself saying "really, you are going there?" several times. Especially when Ruth insisted on getting on the stand and basically explaining why this case was ALL about race. So....I would read it. Honestly, it got 4500 good reviews on Amazon, and I can see why. This is the story of a little boy (who is never named) who lived with his parents and sister in the country. One day, a man who had been renting a room at his family's house was found dead at the end of their road. While the police investigate the case, a younger girl named Lettie offers to take the boy back to her house and keep him company. While at her farmhouse, he meets Lettie's mother and grandmother and thus begins a fantastic fairytale. 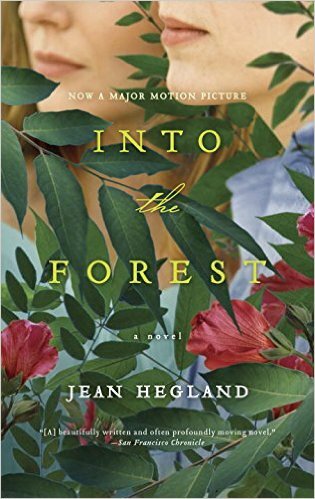 Lettie takes the boy on a walk, and insists she hold his hand, but when he lets go, a "othe world being" takes hold of him and Lettie and her family must work to get this being back where she belongs. 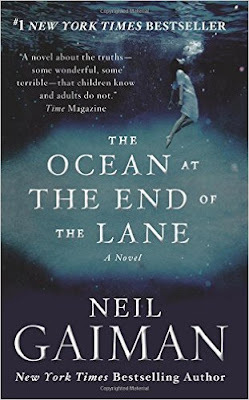 The boy soon discovers that Lettie and her family are immortals disguised as humans and whose lake behind their house becomes an Ocean that heals when needed. This was a great book. I have never read anything about Neil Gaiman, and hadn't heard of him until my husband pulled 3 books of his off his book shelf. He is one of his favorite authors and I can see why. 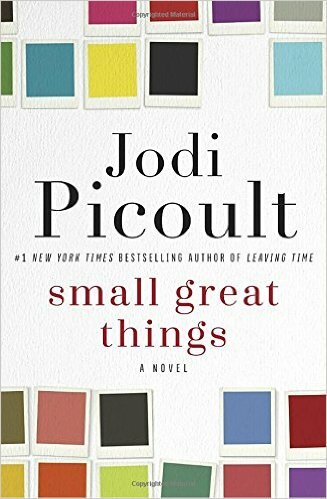 This is a short book compared to some that my husband showed me, but it covered the story beautifully in that short time period. It only took me a day to read this book, but that was mostly because I enjoyed the story and wanted to know where it was going. I didn't realize the little boy was never named until I got to the end of the book and started to look for his name for this blog post. The boy, when he left the house after the being was put back where they belong, was made to forget why he was ever at Lettie's house in the first place. And when he returns 40 years later, some memories return, only to be swept away again as he drives away from their house for the last time. I recommend this book. It was captivating. I think I might actually get another 10 books in this month. We shall see. Winter break for the kids is coming up, and we are traveling, so it is a toss up. If you have read "To Kill A Mockingbird" - you will know all about this book. It is a first draft to that book. In this story, Scout is a 26 year old who lives in New York City. 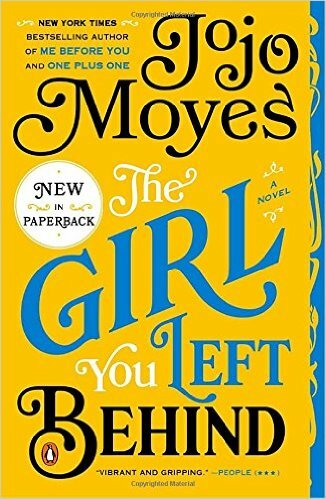 She returns to Maycomb to visit her aging father, Atticus. Her brother, Jem, has died. Her father, in this story, is a racist as is most of the town he lives in. Atticus is not the father that Scout thought he was, and she isn't sure she can live with that reality. This book wasn't great. I don't have much to say about it. 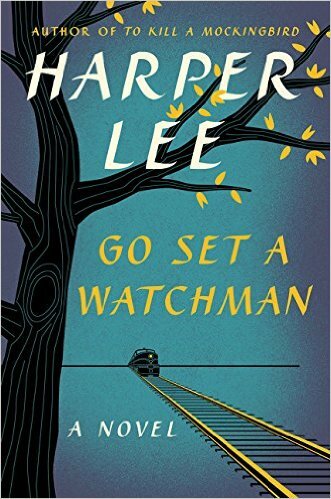 I am glad this didn't come out before To Kill A Mockingbird where Atticus is a hero and a champion among the less fortunate in his town. Here he is just a man who doesn't think that Black people have as many rights as white people and that they are definitely a lesser people who will never catch up to the white man. It is terrible. And the book gets a little ranty about the subject in the end. To the point I just wanted to finish it because I was so disgusted. I know I shouldn't be. I have read many a story with controversial material where people are treated much worse. (i.e. the several WWII novels I have treasured for their writing). I think it was BECAUSE of the Atticus we know from To Kill A Mockingbird that it made it hard for me to like this book. My eldest read To Kill A Mockingbird this year for 8th grade. Her teacher talked to them about Watchman, and she refuses to read it because she doesn't want to tarnish the picture perfect story she sees with Mockingbird. 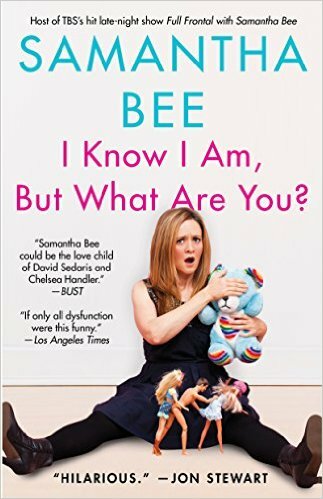 And now that I have read this book, I can't blame her. 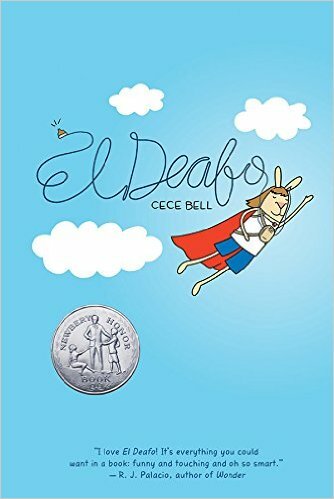 This is a graphic novel and story of a girl who is Deaf. She got meningitis at age 4, and lost her hearing. She has to wear large hearing aids and she doesn't want to go to school fearing that this will attract a lot of attention. It covers her feeling left out because she still cannot hear well even with the hearing aids, and how hard it is for her to make friends when she is wearing a large hearing device on her chest (this book takes place in the 70s). She pretends she is a super hero - El Deafo to help deal with being different. This was a cute book. I read it in about an hour. My eldest daughter read it and enjoyed it as well. She was very interested in the hearing device that was common in the 70s, since hearing aides these days are much more powerful and discreet. They story did explain a lot about how she heard, and that talking louder and slower didn't actually help her understand better. I think it is a great book for kids to understand (at least in the 70s) what it was like to be deaf. There were a few characters that smoked....which is kind of unheard of in books for kids these days. (at least in graphic novels for 2nd graders). So teachers and parents may want to read this themselves before they share with younger ones. This is the story of two sisters names Nell and Eva who live in a remote section of their town on the west coast. The story starts out where society has already started to collapse, their parents are dead and they are left to fend for themselves. Because they are unprepared, they eat through most of their rations and play board games - sure that the power will be back on any moment. Soon, though, they realize that this may be what they have to deal with forever, and start to use the land around them to survive. I enjoyed 2/3rds of this book. The story goes back and forth with the present and the past (although never really gets to WHY there has been a society collapse, just that there was). It talks about how their mother got sick and their father died in an accident. The first half talks about the girls original plans for the future (professional ballet dancer and a Harvard student). And then - the story takes a 180 degree move, and I couldn't help but say...."what?" It didn't make any sense, and didn't add anything to the story, and I was turned off by the idea that the author felt it was necessary. After that, the book actually becomes a bit boring - talks a lot about gardening and canning and finding plants in the woods to survive on. Which COULD be interesting, but it wasn't told in an interesting way. The sisters never return to humanity. They never leave the confines of their little corner of the world, never seek out others. Not even when they learn to survive off the land, they don't venture out to help others. It just....ends. I don't encourage you to read this one. There wasn't any excitement, no real story, and the ending was just...blah. This is a story of a man named Ove. He is a grumpy 59 year old man that has always thrived on order and rules. He likes a quiet life and likes to be left alone. His life was turned upside down 6 months ago when his wife died. He has decided to end his own life, but things keep getting in the way. Soon - new neighbors move next door - a young couple and their two young girls who immediately take a liking to Ove. 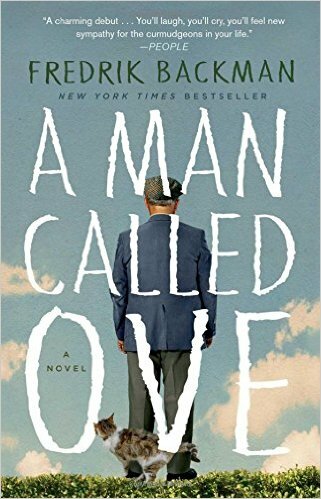 Ove doesn't know what to make of this attention from his neighbors, and before long, he finds himself intertwined in many of his neighbors lives and realizes that there is still much to live for. This is a wonderful story. It is funny and endearing and sweet all at once. Ove is hilarious as a little old man who just wants everyone to do their job and follow the rules. He is always on the lookout for thieves and people who insist on driving their car in his neighborhood that doesn't allow cars. He can't get rid of a stray cat who he names "Cat Annoyance". Ove helps people but grumps about it. But the main theme is that he can't help himself being a good person because that is who his wife saw him as. He honors her memory by being the man she always saw him to be and in the end, all of his neighbors become his friends. GREAT story. Check it out. This is the story of Sophie Lefrevre during World War I. The Germans have invaded France, and her husband has been taken off to fight. She moves to a small town to help her sister and her sister's children and run their families hotel and restaurant. The German Kommandant has taken a liking to Sophie and a painting she has kept in her house. It is a painting her husband - an artist - did of her before he left. She goes down a dangerous road with this Kommandant in the hopes she can save her husband, and it leads to her being sent away from her sister. The other main character in this story is Liv Halston. In Liv's house hangs this painting of Sophie. She and her husband bought it while on their honeymoon. Now that Liv's husband has past away, she has become attached to the one last thing that reminds her of her husband. 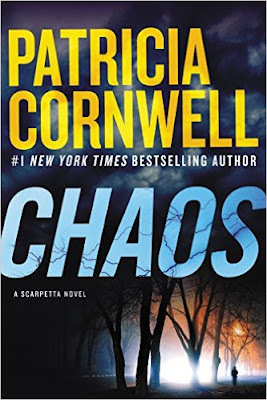 It has been several years since he has done, and a chance meeting of a new guy who brought life to Liv once again leads to trouble with the painting. This book has its good parts, but the parts with Liv just drove me crazy. The story of WWI and Sophie and her family and their struggles to survive while the Germans were stripping them of everything they own, was well told and intriguing. The story of Liv just didn't make much sense. She was extremely attached to this painting and when the family comes looking for it - because it was thought to be stolen by the Germans in 1919 - she has a fit and doesn't want to give it up. She ends up having to sell her house and uses almost all of her money over a painting she bought for $300 10 years ago. While I understood in the end a BIT where she was coming from, the reality of this is - if you have a painting in your house that was stolen by Germans from people who were held captive and you had a chance to give it back.....you give it back. This part of the story just made me roll my eyes one too many times to make me recommend this book. IT is a shame, really, because like I said - the parts about Sophie were really good. 10 books this month! Go me. This is the story of a recluse author named Vida Winter. She has been a beloved author her whole career, but now her life is near the end. She is now ready to release the truth about her life story, which is a tragic past she has never told before. She calls on Margaret who is a biographer, and someone that can write down her final story before she dies. Margaret gets drawn into her story. 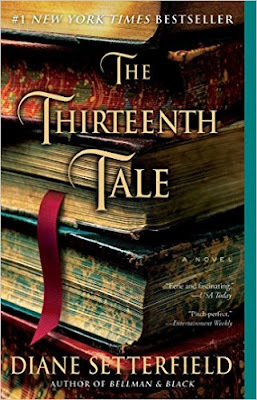 Vida relives the story of Isabelle and her brother Charlie, twins named Adeline and Emmaline, a ghost who lived on the property, a governess who tried to change the lives of this family forever, and a devastating fire that destroyed it all. During Margaret's time with Miss Winter, she reveals secrets of her own family and wallows in grief at the loss of her own twin sister. In the end, Margaret must come to terms with her grief to really understand Vidas story. This book was good for awhile. I loved trying to figure out how all of the characters in Vida's story fit together, and where she actually fit in the whole thing. But Margaret started to become an annoying character, and that basically ruined the book for me. The author made Margaret a very whiny character about a sibling she never knew. All of the sudden she NEEDED her, and she MISSED her, and she wanted to be with her. IT was just weird. And kind of dumb. I felt like it distracted from the base story - Vida's. I don't really think Margaret's story should have been a part of this book - there was enough substance with Vida's to carry it through to the end.